On this episode of Working: Syracuse, we speak to printing press operator Robert Glahn, who works for Eastwood Litho, which is based in Lyncourt on the city's Northside. Founded in 1946 by Justin F. Mohr, a veteran of the U.S. Army Air Corps during World War II, Eastwood Litho has served the Syracuse area for more than 70 years and is now owned by grandsons of the founder — brothers Andrew, Mark, and Patrick. For the last three years, Glahn has been in charge of running the company's two Heidelberg printing presses. He works as a frontender and is responsible for all of the technical tweaks and artistic judgments that inform the end product. The color balance, saturation, and sharpness of the ink on the paper all fall on him. Now 53, Glahn's been doing this job since high school. He serves as the mechanic who enjoys tinkering with the machines when they break and the artist who controls every aspect of the graphic output. Robert Glahn's hands remain the most important thing on the floor. The machine that prints still needs to be maintained, fixed, adjusted and cleaned. Glahn passes the time with music. He's upgraded from this Quasar relic to an iPod, but still listens to past country artists such as Waylon Jennings and Arlo Guthrie. Glahn checks the color balance of the current job using a densitometer, a device that measures the density of a material. 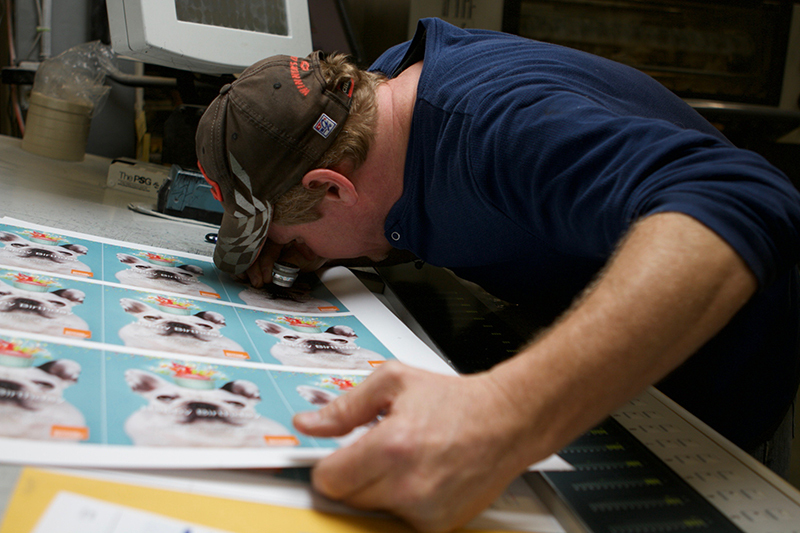 Glahn gets in close to see the layering of colors on this pug-themed job. The magnifier helps him to identify layers that have separated. Glahn slices up a happy-birthday flyer. 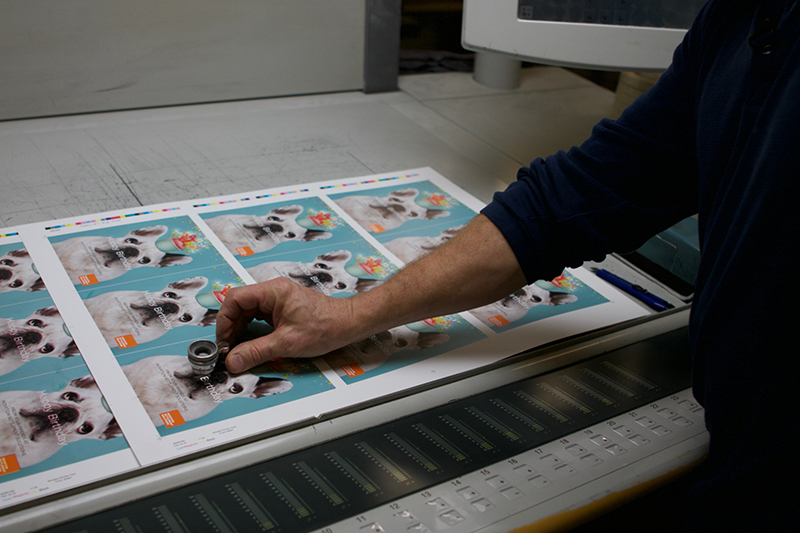 This cutting helps avoid waste and delivers a preview to Glahn of the finished product. Glahn attempts to explain his densitometer. "See? The density's a little better here. A little bit darker. Take a little blue away," he says. "I'm just supposed to make it look as good as I can." 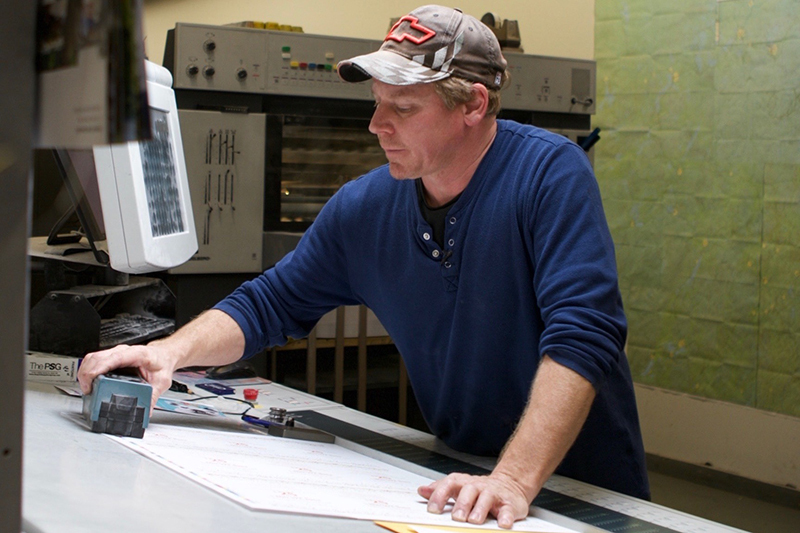 Microscopic attention to detail earned Glahn the ability to work alone on the night shift. Colleague Dave Webert jokes about Glahn "beatimg him around the ear hole" due to his "perfectionist" nature. BRONTE SCHMIT, HOST: Hello and welcome to Working: Syracuse, the podcast inspired by journalist Studs Terkel featuring Salt City residents talking about what they do to earn a paycheck and how they find meaning in those jobs. I'm your host Bronte Schmit. PETER BENSON: The warehouse is never quiet. 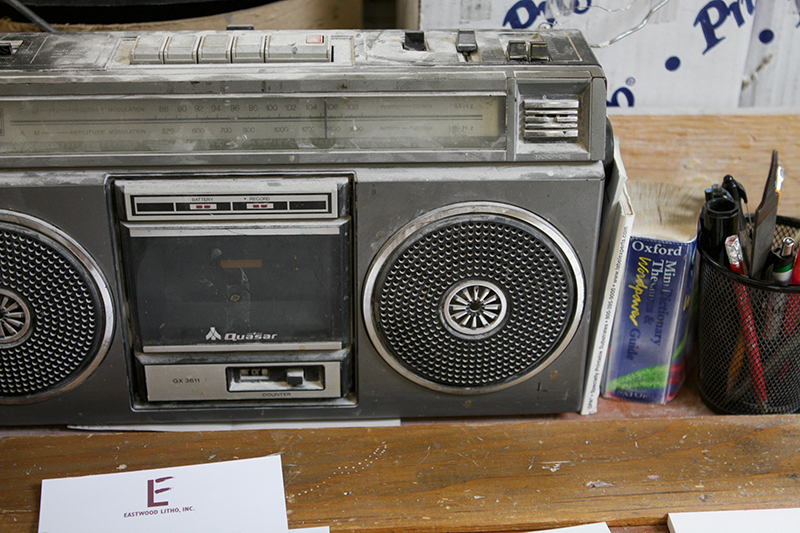 Thirty feet of dull green metal dominates the bare concrete floor as Robert Glahn, the night shift printing press operator, plays his his own instrument. ROBERT GLAHN: I just, just like a piano key. All these correspond with a little ink key up top that opens and closes; gets more and less ink on it. Everything's pretty close on that one. Bit heavy on that end. PETER BENSON: Glahn is hunched over a keyboard, confidently pushing buttons, adjusting the colors of the massive press. The train of paper hums through the machine - zipping through its modules like lost notes in a series of library stacks. 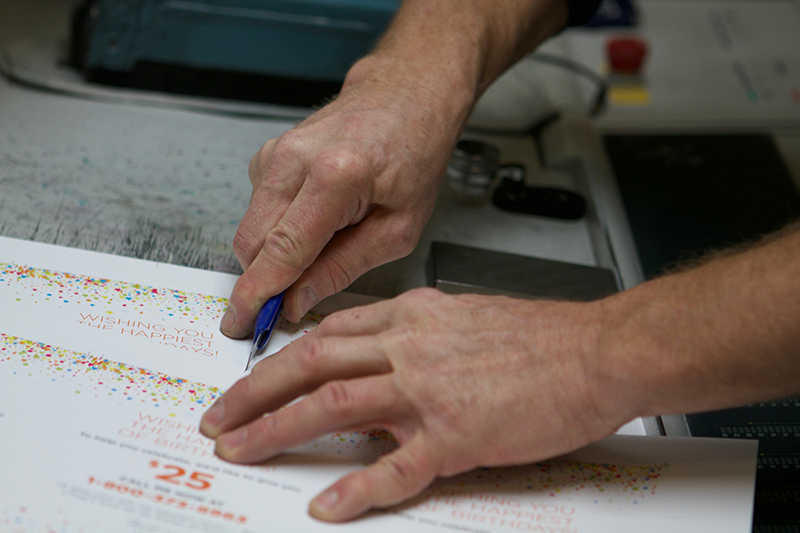 Glahn's fingers make the changes needed for the perfect print. ROBERT GLAHN: My name's Robert Glahn and I run a ten color Heidelberg printing press for Eastwood Litho. PETER BENSON: He sees himself as a producer of art rather than an artist. His care for the craft suggests otherwise. ROBERT GLAHN: Gold's not the easiest color to run. It's a metallic. Metallics have a tendency to absorb a lot of water so it makes printing them a little bit more difficult. Now you can see that there's a problem here. That means it's out of register and if you look at these crosshairs here, you can see that the red's out, back, and to the right. So I will do a change on this. PETER BENSON: Robert has been doing this since high school. And he looks right at home in the shop...ink-stained blue jeans, a long-sleeve T rolled up to his elbows, and a camo Chevrolet cap. He moves purposely between the machine and his instrument. But it wasn't the artistry that got him interested in what he was doing. ROBERT GLAHN: I like being mechanical. I like working and fixing things. When something goes down here, it's handy to be able to get it up and running because if it's broke down, the company's not making any money. So whether it's paperclips and rubber bands. I'm putting it together with so I can get it up and going again, that's what I do. ROBERT GLAHN: Onto the next one. PETER BENSON: From 2pm to midnight, it is just Robert and his partner Dave Webert. The sound of the presses overpower their need to speak to each other. Dave typically listens to the radio through his headphones. Robert also tunes up his own music. he hears far more from Waylon Jennings than he does from Dave. But they have a working rapport. ROBERT GLAHN: Dave's pretty easy to work with. I'm probably the more difficult one to work with. DAVE WEBERT [faintly]: Front enders tend to be like that. They're perfectionists. They're driven [Robert laughs] I get beaten severely around the earhole [Robert laughs]. PETER BENSON: It's fitting that they work in the relative anonymity of the night. Robert realizes most people are ignorant to his efforts. ROBERT GLAHN: Most people don't care. [Laughs] Unless you're printing the newspaper where everybody knows, it doesn't really matter. PETER BENSON: Even if nobody cares who is behind the printing, it nonetheless requires skill. If Robert was purely a mechanic, he may have lost his job years ago. Others in the process have been phased out over the years. But his expertise means that he is still necessary today. ROBERT GLAHN: I just worked my way up. That's all. Comes with the territory. The guy before me, his job got phased out from technology. PETER BENSON: But the technology isn't drastically changing any time soon. 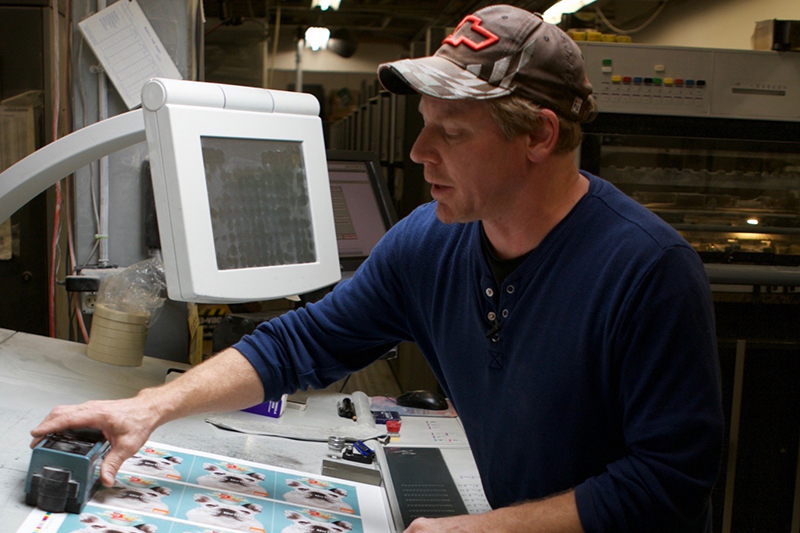 Digital presses are very expensive to run the scale of the jobs that Glahn routinely runs. He isn't worried about being replaced either in the near future. ROBERT GLAHN: Nah. Cause I could just do this. I'll move along with technology. I don't think it'll ever get cheap enough to replace the old fashioned printing. PETER BENSON: Robert has a fondness for old-fashioned technology outside of the workplace also. He has a sailboat that he loves to take out onto Oneida Lake and beyond. ROBERT GLAHN: When I was helping out a museum when I was living in California, and the guy was a geologist. And he told me straight up he goes "you know what by the time you retire gas is going to be so outrageously expensive you're not going to be able to afford it." So I decided to do the sailing thing because I can move around without a ton of petro. ROBERT GLAHN: I think by the time my job phased out I'll be ready to get kick back on the beach. BRONTE SCHMIT, HOST: Thanks Peter. Glahn's not all work though. He admitted that, when he's off, he likes to play a round of what he refers to as hillbilly night golf. When he gets the time, he and his friends light up the links by shooting a few holes. BRONTE SCHMIT, HOST: That's all for this episode of Working: Syracuse. Check out our website www.workingsyracuse.com for more interviews as well as some extra content on Glahn. Be sure to follow us on Facebook and Twitter @WorkingSyracuse. Thanks again to Peter for speaking with Glahn. This episode was written and produced by Peter Benson and Jared Bomba. Extra reporting came from Katie Cohen, Nicole Engelman and Julianna Whiteway. Our theme music was by Logan Piercey. I've been Bronte Schmit and it's time for us to clock out.